I am sure by now all of you know that I really enjoy writing and I am blessed to have so many readers following my blog. I am happy to find this online world where I can share my opinions and experiences and above all to find supportive people who read my blog and share their opinions with me. You must be wondering what the hell the title of this post means. I have been blogging for a while now and except my husband no one around me knows about it. There are a few people who know my identity and know that I blog but they have all come across my blog first and then got to know my identity later. Initially, I didn’t really see it as necessary for people around me to know about my blog because I was not sure where this blog was going. Now after a year I think it is not that important to tell everyone around me that I blog. I haven’t really found anyone who blogs so I always assume that they won’t be interested. But at the same time I knew that at some point of time my family and friends would find my blog. The World Wide Web is so open that if they Google something relating to Nepal or Nepali festival or Nepali culture, there is a high possibility that they will land on my blog. They will recognise me straight away if they are in my Facebook as I use the same photos on both platforms. I have to admit that my parents will be happy to find out that I write on a regular basis. As you know now that I have a few articles published in +977 magazines here in Sydney. Every time it is out in the market, I put that on my Facebook. I wasn’t sure who was reading it but one time my dad mentioned that he has read all my articles and he loved it. He said it is really nice to see me writing and expressing myself. I had sent a few copies of the magazine to Nepal and my mum was so proud that she was showing it to her friends. I smiled reading it because I thought my friends and family would have found my blog a long time ago and it took one of them over a year to do so :). So I would like to welcome to my blog my cousin sister GA who lives in USA. She said she was reading some blog post from this blog and kept clicking on different photos until she got a post with a photo that had her in it. I think that must have been a bit of a shock for her. 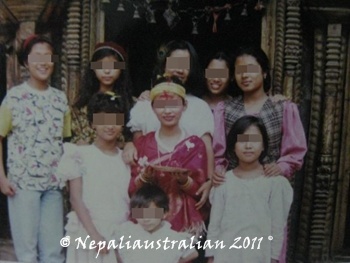 BTW here is the photo and she is the small kid in the middle. That photo was taken at least 13 years ago. While I am at this, I want to address another query. I get lots of people asking me why I am anonymous and why I blur the faces in my photos. I even have some people writing to me angrily that blurring photos are not cool. I know some of you may not like it but one and only reason for my action is purely for the sake of privacy. My life is like an open book on this web so I don’t want everyone to know where I live and other details of my life. Also I don’t want to use my real name on the blog because I don’t want people to Google my name and land on this blog especially if they are my future employer or someone looking for me in an official capacity. 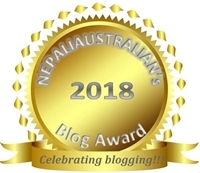 Anyway after year of blogging, I know now that my friends on blogosphere are happy to call me M or nepaliaustralian. So thank you guys for accepting me with my anonymity. Hope everyone else who is angry with my anonymity will respect my reason for my privacy and accept me as M from nepaliaustralian. Does your family and friends know that you blog? Does it make any difference if they know? This entry was posted in Personal and tagged anonymity, blogging, living in west with values of east, M from nepaliaustralian, My life is like an open book, Nepaliaustralian. Bookmark the permalink. I like the way you write! I know why it annoys people, the covering of your eyes – it’s because there is a kind of contradiction in having the photos and yet concealing part of the faces. You feel as a reader if you are being excluded. The rest of us either post photos like Sharell or don’t post them but I think doing it partially is what causes resentment. I do understand the point but I am not comfortable yet. may be one day i will be OK to share 100%. My parents are not very tech-savvy so even if I tell them I have a blog, they won’t even understand what that means or they might get overly-excited for no reason. When I first started my blog, I announced it everywhere. But like you, none of my friends and family had blogs and after awhile most of them expressed no interest. Thanks so much for the support Sid. I really am thankful that I met wonderful people like you because of my blog. It means a lot when I get so much support and love in this online world. I have read some of your posts and I really like how you express your thoughts and I enjoy reading them because there I do not know very many Nepali bloggers.. I maintain a foodblog and keep my identity pretty open but if I was talking about my personal life, culture, relationship I would probably have done the same thing like you do..and always remember you readers/followers are there regardless of your being anonymous or open. I really respect your opinions and honesty on the blog. Thank you so much Dixya :). Blogging helps me to share lots of my thought but sometime its hard to draw the line where to stop . Thanks for reading my blog. Thought it sounded familiar, rofl. I totally get your pov. Believe me, I made conscious choices as well, given what I’ve been through (and put others through a decade ago) although I do talk about it openly and under my name on various places, including facebook. Well said . I will remember that for future. I feel you on this post. Even though, being honest, I have been annoyed by eye-blurred pictures on your blog, it will get better after this. It obviously is a nice feeling to know that your own people have come across your corner on the web. Nice post as always. You are doing great job while making the Nepali celebrations and culture known to the world. Effort really matters. I admire you for the same. Keep rocking. Thank you so much Shilu. You support means a lot. I started blogging a few months back and only my fiance A and my best friend P knows about it :). My reasons for not telling anyone is pretty much same as yours, but i have come across your profile in facebook as we seem to share some common friends and I too recognized you from the pics you posted on the blog, which are blurred and the pics you posted on facebook, which are not blurred but the same pic :). Anyway your secret’s safe with me :P, you have a great blog and if anyone would come to know about it, may it be your employers or friends and family, it’ll be a feather on your cap. Nevertheless all bloggers should understand the need for privacy and respect it :). As I know so many people living in Thailand, I have thought about us knowing common people when I saw your blog for the first time. It is such a small world that among so many people we still manage to bump into people who are in the common circle of our friends or family :). I have to say without Facebook it won’t have been possible.